If you're looking for a new laptop to run a program such as AutoCAD, then you surely need to be prepared with the budget since these kinds of laptops require high-end specifications. There are also few other applications that are used by AutoCAD users such as 3D Max, Revit, Adobe 3D modeling and Solidworks. These are the programs mostly used by architects, and we have done all the research to find the best laptops for AutoCAD. For running such applications, you will need a laptop with a powerful processor, enough storage space, and good Memory. Here in this guide, you can choose any laptop that suits you, and we have made sure all these laptops are extremely reliable and powerful for your needs. Mostly architects used to go with Desktop PC, but nowadays almost every architect has to go to their client and showcase their work. Of course, that's not possible with desktop, and that's the first reason we decided to create this guide to finding the best AutoCAD laptops of 2019. What to look for in an AutoCAD Laptop? First of all, you need a processor that's as fast as possible, and currently, we recommend an 8th or 8th generation i7 Coffee Lake processor for the best performance. Next thing to look for is surely the RAM which should be at least 8 GB and to run the machine smoothly we recommend going with 16 GB of RAM since you will have to do a lot of multi-tasking. Another important thing to consider is the graphics; of course, you don't need a gaming graphics card but a decent GPU that'll be able to handle the rendering tasks. The display size of your laptop is another important factor that needs to be considered. You can't use a mini laptop with an 11-inch display for such tasks, and that is why we suggest going with something that's around 15 to 17 inches. The ASUS ROG ZEPHYRUS is a great laptop for using AutoCAD, but it might not be affordable for everyone. It will cost you somewhere around $1800, and it features super high-end specifications such as 8th generation Intel Core i7 processor and 16 DDR4 RAM. Most of the AutoCAD laptops usually offer top-notch hardware, but this one comes with NVIDIA GeForce GTX 1070 GPU which is way better than any other notebook in this guide. It also includes a fast 512GB NVMe SSD. Well, that's plenty of space for any architect to store the files for at least a couple of years. On top of that, it features a 15-inch full HD 144 MHz IPS display and of course a backlit keyboard. Its battery can keep it turned on for around 5 hours without the need for a plug. Even though it's able to handle all of the latest games, it will be able to run programs like AutoCAD, Sketchup, TurboCAD Pro, ProgeCAD and DraftSight with ease. While it's designed for playing games, it packs a lot of power that can be used to run such applications. The ASUS Zenbook Pro is another great laptop for AutoCAD in 2019. We have also listed it in our guide of best gaming laptops under $1500, and it can effortlessly handle all kinds of applications. This particular laptop from ASUS promises to deliver the performance like no other machine in such price range. Its insides include Intel Core i7-8750HK processor, 512 GB SSD, 16 GB LPDDR4 RAM and NVIDIA GTX1050Ti graphics card. Its 15-inch touchscreen 4k UHD display is the best treat for your eyes and comes with 3840 x 2160 resolution. It packs all the necessary as well as latest ports including Thunderbolt 3, USB 3.1 with Type-C and USB 3.0. It also comes with one full year of International warranty as well as one year of accidental protection. Battery life is also great for a laptop with these specifications. It includes a high capacity battery that can provide up to 9.5 hours of battery life. Here comes another one of the high-budget laptop for AutoCAD. It's as powerful as other machines on this list, but when it comes to design, it's very slim and measures less than 0.7 inches. It's known for its UHD display with InfinityEdge Touchscreen along with the resolution of 3840 by 2160 pixels. The display is very helpful for AutoCAD users, and it also includes 6th generation Intel Skylake Core i7-6700HQ processor, 512 GB SSD, 16 GB DDR4 RAM and NVIDIA GTX 960M graphics card. Dell's XPS series has gained a lot of popularity within very less span of time, and most of their notebooks are fast, powerful and portable. I understand it might not be affordable for everyone, but when it comes to programs like AutoCAD, you simply can't work on budget machines. It features a chiclet keyboard along with smooth touchpad, and we highly recommend it to those who want a powerful yet portable PC. That being said, it can handle intense games as well and is a perfect choice for travelers and everyday users. The Lenovo Thinkpad P50 is a different laptop that is rarely seen at anyone. It's mostly recommended for professionals as well as businessmen that require a lot of power for their programs such as AutoCAD. It's also used by some well-known professional gamers as it packs enough power and good GPU to handle all kinds of games. It comes with Intel Xeon E3-1505MV5 processor, 16 GB DDR4 RAM and 256 GB of SSD. It also includes NVIDIA Quadro M2000m GPU which is pretty expensive if you want to buy it separately. On a conclusive note, it's the best laptop in its budget range and is incredibly fast while running on Windows 10. 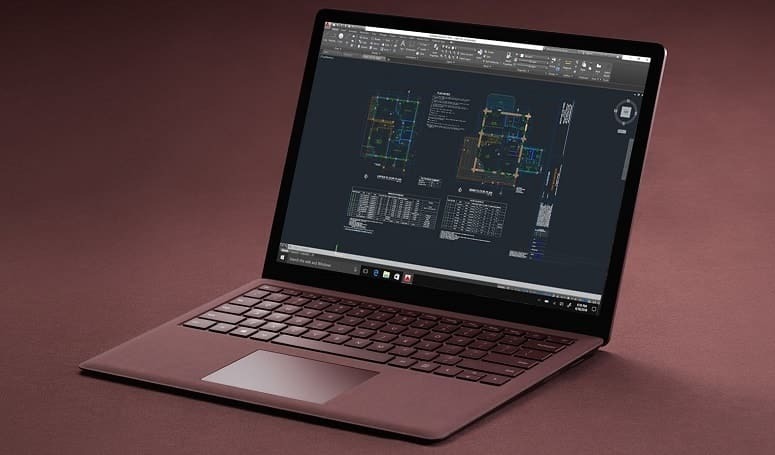 Multi-tasking is never going to be an issue for anyone, and it's undoubtedly the best mobile AutoCAD workstation laptop for architects. You can expect it to run just about any high graphical game or intensive program without ever bothering about the formal requirements. It might be a little heavy to carry around, but it's a great performer and like no other device. The ASUS TUF Gaming Laptop FX504 a very reliable laptop for programs like AutoCAD. Even though we have listed it in the last spot, it's among the best high-performance laptops of 2019. It features and 8th Generation Intel Core i5-8300H processor, 8 GB DDR3 RAM, a 1 TB FireCuda Hybrid Drive and NVIDIA GeForce GTX 1050 GPU. It boasts a unique and stylish design that can't be compared with any other PC in this guide of best AutoCAD laptops. Its 15-inch full HD touchscreen display is an ideal option for architects as well as graphic designers. Other than AutoCAD users, we also recommend it to home users that require a notebook for their regular use. It offers a great design with powerful specifications including a backlit keyboard rated at 20-million keystroke durability and an anti-dust cooling system. It comes with pre-installed Windows 10 Home and is surely a decent option for gamers. Hence, it's clearly not the most powerful notebook for using AutoCAD, but it's definitely above average. Whether you’re an architect or a student, you now know what kind of laptop you need. Remember that AutoCAD needs a laptop with great graphics processing specifications and plenty of memory. You should also prefer going with a laptop that comes with pre-installed Windows 10 rather than an older operation system version. So that’s it for us, it’s your turn now to tell us what laptop you think is best for AutoCAD. Quad-Core Or Dual-Core: Which One Is Best For Me? HP vs Lenovo Laptops: Which Brand To Choose In 2019? Razer vs Alienware Laptops: Which Brand To Choose In 2019? Asus vs HP Laptops: Which Brand To Choose In 2019? Asus ROG Vs Alienware Laptops: Which Brand To Choose In 2019?